Kilimanjaro is one of the few places on earth that encompasses every ecological life zone including tropical jungle, savannah, desert, montane forests and alpine environment.The best times to climb are during the warmer and drier months. Machame Gate at 9am, leave Moshi for Machame gate where you will meet our porters, guides, and cookers that will spend the next 7 days trekking with you to Uhuru peak, the root of Africa. Once you arrive, wait at the gate while we register you climb, porters and guides make final preparations. You first day’s destination is Machame camp. Each day porters and cookers will walk ahead to set up the camp in time for your arrival. On the first day, hike through the moss-covered trees of Kilimanjaro cloud forest. Although considered to the easiest day on the Machame Route, today trek includes several uphill sections plenty of drinking water, as the exposed hike can be hot on a clear day, several viewpoints from which you can see the forests below, kibo and Mawenzi Peaks above. After breakfast hike east on the Shira Plateau before reaching the junction for Shira and Lemosho Route, continue on through the barren landscape before stopping for lunch. Shortly after lunch reach the highest point of the day before descending quickly to Barranco camp. Although this up and down day ends with elevation gain of only 110 meters, by early afternoon you will have climbed 690m to height of 4,530m before beginning your descent to Barranco camp. Leave Barranco cap after breakfast for Karanga Valley, The day begin with a 1.5 hour scramble up Barranco wall. This is the hardest part of the day and in some places you will have to use your hands to pull your body up. After reaching the top make a short descent into the greener Karanga Valley. We generally on the ridge above the valley to allow for greater acclimatization. After breakfast begin the hike to Barafu Camp .On the way to Barafu view several of Kibo’s glaciers as well as the junction that connects the descent route. 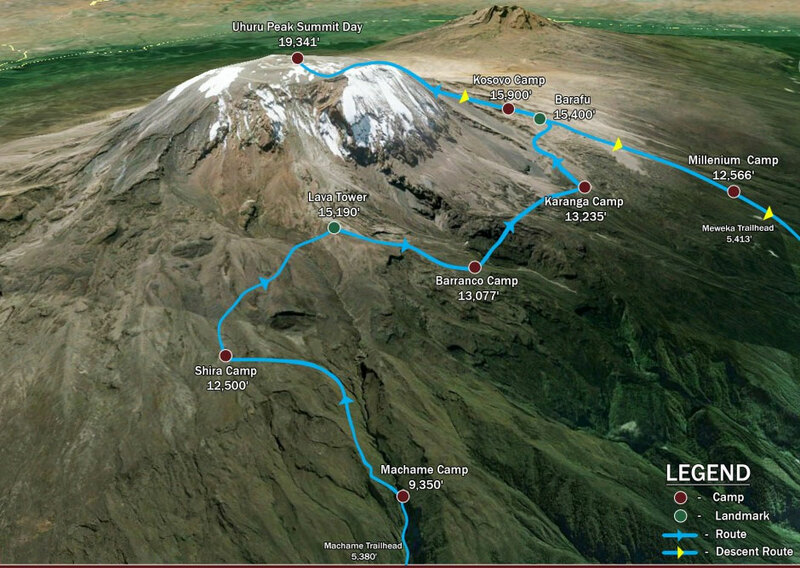 Around midnight begins the final ascent to Uhuru Peak, the highest point in Africa. For the next six hours hike by the light of your headlamp. The ascent to the crater rim is the most challenging part of the entire trek. The trails steep until you reach the crater rim at Stella Point. After breakfast, finish with a descent to Mweka Gate. Your last hike on Kilimanjaro is a beautiful one, passing through Kilimanjaro’s cloud forest. Watch your step during the descent, as the trail can be slippery. Our vehicles will be waiting at the lower station of Mweka Gate to take you back to Moshi. You will able to buy t-shirts. After breakfast talk a work around Moshi town, then off to the airport assist yourself to your flight. They can give us valuable insights on how to improve what we're doing. Would you tell us how you feel about this package "Kilimanjaro Trekking - Machame Route" on a comment down below.